Feel like you’re attending an elegant dinner party every night with the Baytown 60" Angleton 6-Chair Dining Set. This American-made dining set includes six chairs and a beautiful table to breathe life into your dining area or kitchen. Capture the attention of guests with the smooth, shiny finish of these finely crafted pieces. 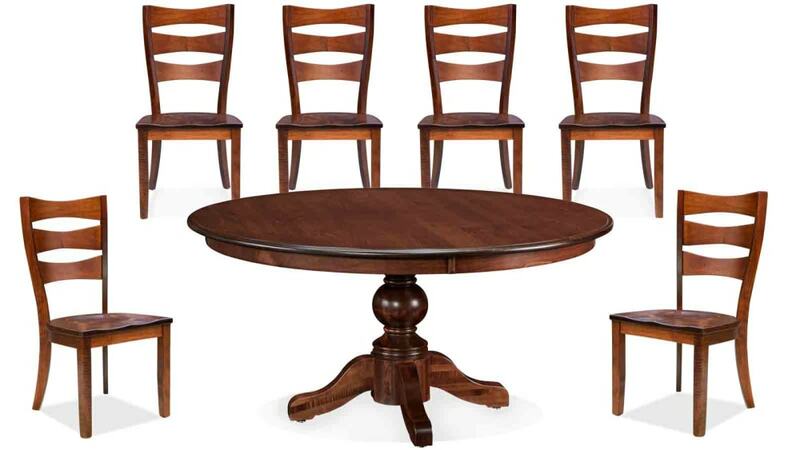 Let this dining set be the focus of the room with its solid wood construction. The neutral yet sophisticated style will match almost any décor theme. With six seats, this is the perfect setting for those significant family meals and gatherings. This chic dining set was made in America by experienced furniture artisans. These are all Amish-made for exceptional durability. The solid maple wood functions without fail. Reinforced by a strong pedestal base, this table is here to stay. Six stable chairs support each dinner guest. Amish made furniture is known for being made with the finest of careful craftsmanship. With this gorgeous dining set, you'll have a piece of furniture to last for generations. This dining set will become a symbol of cherished memories for you and your loved ones.